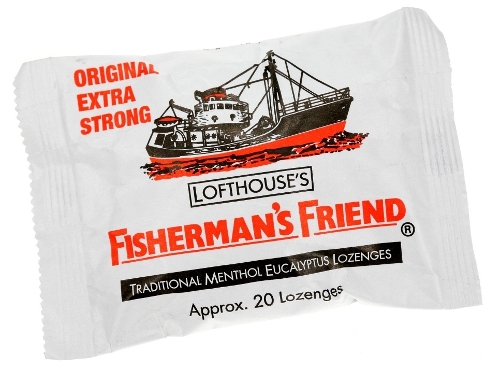 I used to enjoy sucking a Fisherman's Friend when I watched the local rugby team. Helped me to concentrate and kept the old pipes clear for bellowing curses at the players when they fumbled the ball. I don't go so much now and got out of the habit of buying them. I reacquainted myself with the original extra strong flavour the other day. (Tweedy always prefers originals.) What have I been missing? Most refreshing. Made in Fleetwood, Lancashire, by Lofthouse's since 1865, they're pretty popular in Scandinavia, particularly Finland, where they're mixed with vodka. Now that's a manly concoction.